The epigraph is taken from the short story “Youth” by Joseph Conrad: “And this is how I see the East…. I see it always from a small boat—not a light, not a stir, not a sound. We conversed in low whispers, as if afraid to wake up the land…. It is all in that moment when I opened my young eyes on it. I came upon it from a tussle with the sea.” How does this set up the major themes of The Cat’s Table? How is the voyage itself a metaphor for childhood? Why do you think the opening passages of the book are told in third person? 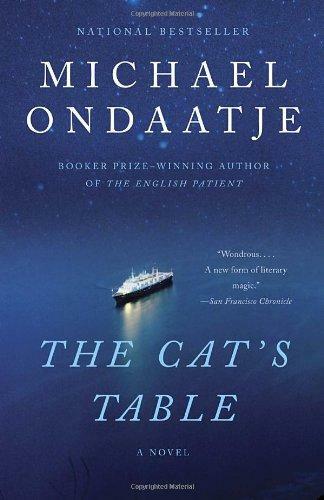 We are 133 pages into the novel before Ondaatje gives us an idea of what year it is. How does he use time—or the sense of timelessness—to propel the story? The anonymity of ocean travel and the sense that board ship we know only what others want us to know about them come into play at several points in the novel. What is Ondaatje saying about identity? Discuss the importance of some of the seemingly minor characters at the table: Mr. Mazappa, Mr. Fonseka, Mr. Nevil. What do they contribute to the story? “What is interesting and important happens mostly in secret, in places where there is no power,” the narrator realizes (page 75). “Nothing much of lasting value ever happens at the head table, held together by a familiar rhetoric. Those who already have power continue to glide along the familiar rut they have made for themselves.” How does this prove true over the course of the novel? How do the narrator’s experiences breaking and entering with the Baron change his way of looking at the world? Discuss the three boys’ experience during the typhoon. How does it affect their friendship and their attitude toward authority figures? How does the death of Sir Hector factor into the larger story? On page 155, the narrator refers to Ramadhin as “the saint of our clandestine family.” What does he mean? When describing the collapse of his marriage, the narrator says, “Massi said that sometimes, when things overwhelmed me, there was a trick or a habit I had: I turned myself into something that did not belong anywhere. I trusted nothing I was told, not even what I witnessed” (page 203). What made him behave this way? How did it affect his marriage? On page 208, the narrator tells us about a master class given by the filmmaker Luc Dardenne in which “he spoke of how viewers of his films should not assume they understood everything about the characters. As members of an audience we should never feel ourselves wiser than they; we do not have more knowledge than the characters have about themselves.” Why did Ondaatje give us this warning, so far into the novel? What is he telling us? What was your reaction to the revelations about Miss Lasqueti? How do you think her letter to Emily might have changed the events on board the Oronsay? Why didn’t she send it? Miss Laqueti signs off her letter, “‘Despair young and never look back,’ an Irishman said. And this is what I did” (page 231). What does she mean? Discuss Emily’s relationship with Asuntha. Did she, as the narrator suggests on page 251, see herself in the deaf girl? When Emily says to the narrator, “I don’t think you can love me into safety,” (page 250), to what is she referring? What is the danger, decades after the voyage? The narrator wishes to protect Emily, Cassius has Asuntha, and Ramadhin has Heather Cave. “What happened that the three of us had a desire to protect others seemingly less secure than ourselves?” he asks on page 262. How would you answer that question?